This morning I am especially Thankful because I am here writing for you. I have to apologize no photo's this morning but soon. I'll be back to regular posting. My Thankful list last Thursday included my thanks for my new job. Which is where I am now! I arrived a little early and realized I had time at least to write a few lines. I am very happy with this little job. I work Tues. and Thurs. 9-3:00. I'll work a little more in a few weeks when my boss goes on a cruise. But for now this is great! And I get to use the inter-net. Our weekend was great. I mentioned I was thankful for my daughters birthday. There was a surprise party on Sat. the teenagers she works with planned it all. She teaches horse back riding at a childrens home. On Sat. after church she came to our house and we took her to a little resturant on the lake. We aren't lake or boating people so it was fun watching the boats come in. My grandson who is almost 4 said the funniest thing. He was looking at this young woman and leaned over and whispered to his momma..."Why is the lady in her underwear?" We all cracked up. She had to shush him really quickly and explained that she was wearing a swimming suit! We fed ducks and fed ourselves. My daughter later posted on fb that it was the best birthday ever. I think that was because of the horse! Actually I am sure it was. I'll post photo's and the story behind the horse that God gave her. I have to get to work now. But I just wanted to share my Happy Day with you! Is your day starting out Happy? Author has new fan . . . But . . .one of my favorite authors has a new fan and a new book. You see . . . this fan is very, very, very discriminating. I should know it is my very own Cowboy. But he read this one . . . The Covert Element by John L. Betcher is the third in the series. My Cowboy is asking to read the first two. And, I would suspect your husband would like (I say like because I don't think Cowboy would use the term love) it too! The amazing thing is I love them. Amazing because usually we don't like the same kind of books. The Covert Element will have you on the edge of your seat from the beginning. Betcher does a great job of weaving an intriqueing and thrilling story about current events or issues and making the story seem believeable without being 'Hollywood'. The Covert Element is about Mexican drug cartels setting up drug operations in small town America. Both Cowboy and I are waiting for the movie! We just finished Knight and Day with Tom Cruise . . . if you've seen it the Becker series remind me of the movie. Fast past and edge of your seat. I found the summary of the story over at the authors site . . .
Former military intelligence operative, James "Beck" Becker and his CIA code-cracking wife, Beth, have retired to Beck's hometown of Red Wing, Minnesota. Their retirement has already proven more exhilarating than they'd expected. But they could never have anticipated the new source of crime and intrigue in their small community. A Mexican drug cartel has set up shop a few miles down the road. And they're not just selling. The new meth production facility is the largest north of the Rio Grande. To complicate matters further, Terry "Bull" Red Feather's former comrade-in-arms has come to visit. And he's on a mission. His decades-long assault on the cartels is coming to a head with a plan to blow up the Minnesota meth plant ... if he can find it. He wants Bull to help. The Beckers' challenge? To dismantle cartel operations before a full-blown drug war breaks out in Red Wing. to check out what a few other readers think. And, you can go to the authors site to read the first chapter. So, how do I rate The Cover Element? As many stars as allowed. I really enjoyed it and all the "Beck" stories. And, I am waiting for the next one. And, well I just can't wait for a 'Beck' movie. 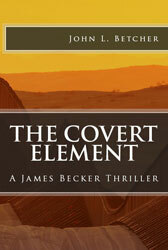 The Covert Element is available at Amazon. . .
Because of the purpose of this blog and the content of My Journey Back I feel like I need to let my regular readers know about the language in The Covert Element. There is one word used one time that would be offensive to some readers. It is a word that I know that the author would not use himself. And is a word that I would not use. It is a word that would in some cases cause my 'discriminating' Cowboy to put the book down and not finish. And, frankly I wish that Mr. Betcher had used a different word. I also wonder why he chose that particular word. I sincerely hope that my friend Mr. Betcher will understand why I feel it is important to let my readers know.